California fire officials say planning more burns safely could reduce catastrophic risks posed by wildfire. 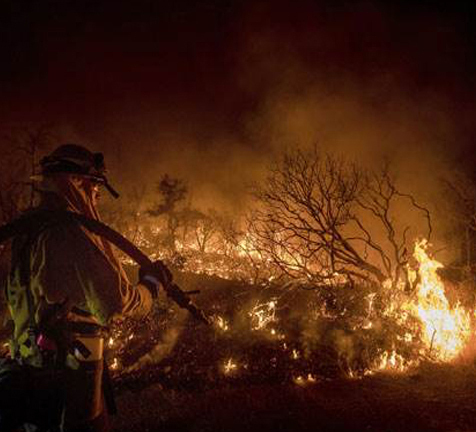 (Cal Fire) With climate change, wildfires threaten disaster and chaos in more California communities, more often. But experts say it’s possible to avoid catastrophic harm to human and forest health by setting planned burns before human error, lightning or arson choose when fires start. “It was like a blowtorch,” said Scott McLean, deputy chief at the California Department of Forestry and Fire Protection (Cal Fire). “We could’ve put every piece of equipment in its path and that fire would’ve gone over it, under it, through it. It wouldn’t have mattered.” Entire neighborhoods turned to ash, and many were caught off guard as the fire roared through homes in the middle of the night, leaving little time for escape. “What really got to me was the amount of vehicles still parked in their driveways,” McLean said. Fires are more damaging because we keep building houses in harm’s way! The California fires stretch the definition of “natural disaster” because human activities have exacerbated their likelihood, their extent, and their damage. Deliberate decisions and unintended consequences of urban development over decades have turned many parts of the state into a tinderbox. M Fire is about to write a White Paper report to provide real solutions to wild fires and there ability to consume homes and lives because some of these crazy idea of lighting back fires are just another way to waste wild fire funding that will have little impact on saving homes.